Lu Hsien-ming was born in Taipei 1959, and graduated from the Fine Arts Department of Chinese Culture University in 1982. He was a member of the Huagang Chinese Modern Arts Society, Taipei Art Group, Hantoo Art Group. Lu was also the winner of the New Talent Award of the 6th Hsiung-Shih Fine Arts Awards in 1981, First Prize of the Taipei Biennial of Contemporary Art in 1992, and First Prize of Liao Chi-Chun Oil Painting Awards in 2002. 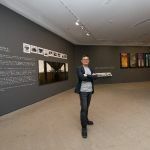 He has shown over 100 exhibitions in established museums and galleries both in Taiwan and abroad during past few years. His work has been acquired by museums, such as Ludwig Forum for International Art, and private collections. Lu Hsien-ming’s work has always revolved closely around his thoughts on culture, which form in his living environment. He hopes to positively engage with the tendency of the society, address local affairs, and extends his subject matters of his works to historical interpretation and reflection on the present time. 1982	B. A. in Fine Art, Chinese Culture University, Taipei, Taiwan. 1984-1986	Chairman of the Hua Kung Modern Art Association. 1984-1986	Editor of the Mountain Wind Art News. 1992-1994	Chairman of the Taipei Painting Art Group. 1995-1997	Executive Secretary, the Taipei Visual Arts Institute. 1999-2001	Board Member of Managers, the Taiwan Institute of Visual Arts, R.O.C. 2001-2002	Executive Director, the Taiwan Institute of Visual Arts, R.O.C. 2002-2005	Board Member of Manager, the Taiwan Institute of Visual Arts, R.O.C. 2003-2007	Chairman of the Hantoo Art Group. 2005-2007	Board Member of Manager, the Taiwan Institute of Visual Arts, R.O.C. 2007-2009	Board Member of Manager, the Taiwan Institute of Visual Arts, R.O.C. 2009-2018	Standing Supervisor, the Taiwan Institute of Visual Arts, R.O.C. 1985	“Blue Tremble” , Chiaug Ren Gallery, Taipei, Taiwan. 1993	“City Aesthetics” , Taiwan Art Gallery, Taipei, Taiwan. 1996	“City-Nature: Harmony or Collusion?” , Masterpiece Art Center, Taipei, Taiwan. 1998	“Bold Designs” , Impressions Art Gallery Part II, Taipei, Taiwan. 2000	“Cultural Sketch” , Tunghai University Art Gallery, Taichung, Taiwan. 2003	“Taipei ･ New Image ･ People” , Taipei Fine Arts Museum. 2005	“Neighborhood Sketch”, Living Lounge Gallery, Taipei, Taiwan. 2008	“City‧Theater”, Lin ＆ Keng Gallery, Taipei, Taiwan. 2010	“Urban Memoir”, Lin ＆ Keng Gallery, Taipei, Taiwan. 2014	“A City of Silence”: Taipei, 1984 to 2014″, Today Art Museum, Beijing, China. 2015	“A Tale of Two Cities”: Glimpses of Cities, Museum of Contemporary Art, Taipei, Taiwan. 2017	“The warmth in the cold”,Taitung Art Museum,Taitung. 1981	The 6th New Talent Award of Hsiung-Shih Fine Arts, First Prize. 1988	Contemporary Art Trends in the Republic of China 1988, Honorable Mention. 1992	The Taipei Biennial of Contemporary Art, 1992, First Prize. 2002	Liao Chi-Chun Oil Painting Award, First Prize. 1982	“Inventive Artists Exhibition”, Today Gallery, Taipei. 1985	“Ten Years Retrospective Exhibition of Inventive Artists”, Hsiung Shih Art Gallery, Taipei. 1985	“Made Atomic Bomb of Art Statement”, His-Men-Ting, Taipei. 1985	“The 1st Taipei Painting Art Group Exhibition”, Domestic Art Center. 1985	“1985 New Painting Exhibition”, Taipei Fine Arts Museum. 1986	“Contemporary Art Trends in the Republic of China”, Taipei Fine Arts Museum. 1986	“Exhibition of the Theme His-Jang”, King-Ti Building, Taipei. 1986	“Second Sino-Korean Modern Painting Exchange Exhibition”, Taipei Cultural Center. 1986	“Style 22 Exhibition”, Taipei Fine Arts Museum. 1986	“New Representative Exhibition”, Taipei Fine Arts Museum. 1987	“The New Outlook of Contemporary Painting of the Republic of China”, National Museum of History Republic of China. 1987	“1987 New Painting Exhibition”, Domestic Art Center. 1987	“Pusan Youth Biennial Exhibition”, Pusan, Korea. 1987	“Third Sino-Korean Modern Painting Exchange Exhibition”, Seoul, Korea. 1988	“Art Development Exhibition of the Republic of China , Taiwan Museum of Art. 1988	“Contemporary Art Trends in the Republic of China”, Taipei Fine Arts Museum. 1989	“Taipei Painting Art Group Exhibition”, Taipei Fine Arts Museum. 1989	“Sino-Korean Modern Painting Exchange Exhibition”, Seoul, Korea. 1990	“Contemporary Art Trends in the Republic of China”, Taipei Fine Arts Museum. 1991	“Taipei Sentiment”, Muh Shyr Yuan Gallery. 1992	“Sixth Asian International Art Exhibition”, Fukuoka Museum of Art, Japan. 1992	“Inauguration Exhibition”, Taiwania Gallery, Taipei. 1992	“Concerning Taiwan Poster Exhibition”, It Park Gallery, Taipei. 1992	“The Taipei Biennial of Contemporary Art, 1992”, Taipei Fine Arts Museum. 1992	“Taiwan Power Exhibition”, Taipei Fine Arts Museum. 1992	“Taipei Painting Art Group in Taichung”, Modern Art Gallery, Taichung. 1992	“A Humanity Introspective”, Taipei County Cultural Center. 1992	“An Invitation to an Epiphany”, IT Park Gallery, Taipei. 1992	“New Romanticism Exhibition”, New Trends Gallery. 1992	“Taiwan Art of the End of the 20th Century”, Modern Art Space, Taichung. 1992	“1992 Sino-Korean Modern Painting Exchange Exhibition”, National Museum of History Republic of China. 1992	“Art Galleries Fair R.O.C. 1992 Taipei”, Taipei World Trade Center. 1992	“Seventh Asian International Art Exhibition”, Banduhg, Indonesia. 1993	“Red Enzyme”, Taiwan Gallery, Taipei. 1993	“The Art Exhibition Toward Apex”, G. Zen 50 Art Gallery, Kaohsiung. 1993	“New Art, New Tribes-Taiwan Art in the Nineties”, Hanart (Taipei) Gallery. 1993	“Taipei Painting Art Group ‘93—Knowing Myself”, Min Sheng Gallery, Taipei. 1993	“Taiwan Art: 1945-1993”, Taipei Fine Arts Museum. 1993	“Search of Contemporary Art”, Galerie Elegance. 1993	“Art Galleries Fair R.O.C. 1993 Taichung”, Taichung World Trade Center. 1993	“The Eighth Asian International Art Exhibition”, Tagawa, Japan. 1993	“93 Brilliant Minds Exhibition”, Pretty Art Center. 1994	“Artists’ Scrapbook”, Taiwan Gallery, Taipei. 1994	“Dimensions Welcome to Spring Exhibition”, Dimensions Art Center. 1994	“1994 Chinese Culture Exhibition”, Impressions Art Gallery. 1994	“The Taipei Biennial of Contemporary Art, 1994”, Taipei Fine Arts Museum. 1994	“Examining Taiwan City Life via Art”, Gate Gallery. 1994	“The Ninth Asian International Art Exhibition Art Exhibition”, National Museum of History Republic of China. 1994	“Taipei Painting Art Group ’94—Into the Crowd”, Min Sheng Gallery, Taipei. 1994	“Taipei Art Fair 1994 International”, Taipei World Trade Center. 1994	“Japan Asian Art Exhibition”, Hiroshima Museum, Japan. 1995	“The Dazzling Outside World”, Taiwan Gallery, Taipei. 1995	“1995 Chinese Culture Exhibition”, Impressions Art Gallery. 1995	“The Contemporary Art of Taiwan”, Museum of Contemporary Art, Sydney. 1995	“Taiwan Legend Contemporary Painting in Taiwan”, Galerie Pierre. 1995	“The Tenth Asian International Art Exhibition”, Singapore. 1995	“Human Rights Poster Exhibition”, Taipei Fine Arts Museum. 1995	“Artists’ Spirit sketch”, IT Park Gallery, Taipei. 1995	“Taipei Art Fair 1995 International”, Taipei World Trade Center. 1995	“Modern Taiwan Folk Art Progresses”, Metaphysic Art Gallery, Taipei. 1995	“New Language-Taipei Painting School ’95”, Min Sheng Gallery Taipei. 1996	“Good Luck with Mouse”, Shin Leh Yuan Art Space, Taipei. 1996	“A Dialogue Between Taiwan and Chinese Captured Provinces”, Taipei County Cultural Center. 1996	“Taiwan Modern Art Pioneers Exhibition”, Yin Shiuan Gallery, Hong Kong. 1996	“Taiwan—Present Art”, Ludwig Forum of the International Art, Germany. 1996	“Taipei Biennial: The Quest for Identity”, Taipei Fine Arts Museum. 1996	“Discovering the New Power of Taiwanese Art”, Galeric Pierre. 1996	“Taipei-Peiking-Urumchi, Masters Exhibition”, Hsin Chuang City Culture Center. 1996	“1996 Taipei Modern Art Exhibition”, Shang Hai Museum. 1996	“A Contemporary View of Taiwanese Arts—Hanart’s Choice”, Hanart (Taipei) Gallery. 1996	“Taipei County Artist Exhibition”, Taipei County Cultural Center. 1996	“Impressions Art Gallery Part II Inauguration Exhibition”, Impression Art Gallery Part II. 1996	“Taipei Art Fair 1996 International”, Taipei World Trade Center. 1996	“Contemporary Art Trends in Taiwan”, Hsin-Chuang City Culture Center. 1996	“Taiwan Burgeoning Trend”, Impressions Art Gallery Part II. 1996	“Postmodern Paintings”, Ever Harvest Art Gallery. 1997	“Sadness Transformed-228 Commemorative Exhibition”, Taipei Fine Arts Museum. 1997	“Taipei Modern Art Exhibition”, National Dr. Sun Yat-Sen Memorial Hall. 1997	“Consistency & Continuation”, Galecie Pierre. 1997	“Taipei Art Fair 1997 International”, Taipei World Trade Center. 1998	“New Voices: Contemporary Art Dialogue Among Taipei, Hong Kong and Shanghai”, Hong Kong Arts Center and National Taiwan Arts Education Institute. 1998	“Love Taiwan”, Metropolitan Gallery. 1998	“Taiwan Modern Artist Exhibition”, Apollo Art Gallery. 1998	“Taipei Modern Art Exhibition”, Seoul Sejong Cultural Center, Korea. 1999	“An Examination of Taiwan’s culture”, G. Zen 50 Art Gallery, Kaohsiung. 1999	“Unravelling the Code of Images”, Lin ＆ Keng Gallery, Taipei. 1999	“Modern Painting Exchange Exhibition”, Kwangwa Information & Culture Center, Hong Kong. 1999	“Perseverance Taiwan”, Yeong Du Museum, Tainai, Taiwan. 1999	“Visions of Pluralism Contemporary Art in Taiwan 1988–1999”, China Art Museum , Bijing. 1999	“Taipei Art Fai International”, Taipei World Trade Center. 2000	“2000 Gallery Inauguration Exhibition”, 2000 Gallery,Taipai. 2000	“2000 New Era Taiwan Modern Painting”, Fine Art Center,Tainan,Taiwan. 2000	“A Beautiful New World”, Ching Shiu Art Space, Taichung, Taiwan. 2000	“The 15th Asian International Art Exhibition”, Tainan County Cultual Affairs Bureau, R.O.C. 2000	“Six Ways to Look For Shangri-La”, Dimensions Art Center. 2001	“Sound of Silence”, Hong – Gah Museum, Taipei. 2001	“Butterfly‧Fragrant Ink‧Clothing World”, Power Space, Taichung Cultural Center, Taiwan. 2001	“The 16th Asian International Art Exhibition”, Guangdong Museum of Art, P.R.China. 2002	“Gypsy Art & Social Sentiment”, Main – trend Art Space,Taipei. 2002	“Taiwan Political Art Exhibition”, Jeff Hsu’s Art Gallery, Taipei. 2002	“The 17th Asian International Art Exhibition”, Dejeon Municipal Museum of Art, Korea. 2002	“The First Triennial of Chinese Arts”, Guangzhou of Art,P.R.China. 2003	“Kingkon and Barbie 13 touch”, stock 20 , Taichung, Taiwan. 2003	“Kingkong touching Barbie”, Hong – Gah Museum, Taipei, Taiwan. 2003	“The Trails Time‧50 Years Taiwanese Art since the End of World War Ⅱ”, Chang Liu Art museum, Taoyuan,Taiwan. 2003	“The 18th Asian International Art Exhibition”, Hong Kong Heritage Museum, Hong Kong. 2003	“Kingkon and Barbie turn motor in Kaouhsiung”, Sinpink pier Art space, Kaohsiung. 2003	“Kingkon, Barbie and together to touch”, The Pier-2 art District, Kaohsiung. 2004	“Contemporary Taiwanese Art in the Era of Contention”, Johnson Museum of Art, Cornell University, New York. 2004	“The Transitional Eighties – Taiwan’s Art Breaks New Ground”, Taipei Fine Arts Museum. 2004	“The Multiform Nineties – Taiwan’s Art Branches Out”, Taipei Fine Arts Museum. 2004	“Environment & Art Exhibition”, National Chang Kung University Art Gallery, Tainan, Taiwan. 2004	“ms-14 Hantoo Art Group 2004 Taipei Exhibition”, Nan Gallery, Taipei. 2004	“The 19th Asian International Art Exhibition”, Fukuoka Asian Museum of Art, Japan. 2004	“Eye Dream – Multiple realities in Contemporary Photographies and Paintings from Taiwan”, Taipei Information & Culture Center, Paris. 2005	“The Moment of Concentration-Taiwan New Realism”, Chienkuo Technology. 2005	“MS 8+5 Handtoo Manbo ”, National Taiwan Museum of Fine Arts, Taichung, Taiwan. 2005	“Alien Land- Metropolitan Variations”, Taipei Fine Arts Museum, Taiwan. 2005	“Figurative Painting in Taiwan”, Taipei Fine Arts Museum, Taiwan. 2006	“International Art Fair”, Hwa Shan Art District, Taipei, Taiwan. 2006	“Macro Vision, Micro Analysis, Multiple Reflections – Contemporary Art in Taiwan since 1987”, National Taiwan Museum of Fine Arts, Taichung, Taiwan. 2006	“Taipei/ Taipei : Views and Points”, Taipei Fine Arts Museum, Taiwan. 2006	“Art in Taiwan 1950~2000”, China National of Art Museum,Beijing, China. 2006	“Formosa Mambo Artistic Development and Social Transition in Taiwan II”, Kaohsiung Museum of Fine Arts, Taiwan. 2006	“A Moving Memory”, Institute of Modern History, Academia Sinica,Taipei. 2007	“Landscape”, Galeric Pierre, Taichung, Taiwan. 2007	“Mou.i.kai－The Exhibition by Hantoo Art Group”, Kuandu Museum of Fine Arts, Taiwan. 2007	“Hantoo Art Group”, Lin ＆ Keng Gallery, Taipei. 2007	“City to City”, Lin ＆ Keng Gallery, Beijing, China. 2007	“Let`s go Bag to the Life Circle”, Galeric Pierre, Taichung, Taiwan. 2007	“Styles of Radical Will – The Multiform Nineties: Taiwan`s Contemporary Art”, Soka Art Center, Taipei, Taiwan. 2007	“Impressions Contemporary”, Impressions Art Gallery, Taipei, Taiwan. 2008	“New Year Exhibition Opening Ceremony – Space B”, Lin ＆ Keng Gallery, Taipei, Taiwan. 2008	“Boundless Visions”, Taipei Fine Arts Museum, Taipei, Taiwan. 2008	“Truly Hero”, Metaphysical Art Gallery, Taipei, Taiwan . 2008	“Intimate Trend”, Kuandu Museum of Fine Arts, Taipei, Taiwnn. 2008	“The Empire Strikes Back Episode II – Surprise Attack”, Impressions Art Gallery, Taipei, Taiwan. 2008	“Expand and Fusion – Chinese Modern Oil Painting Exhibition”, Nationwide travelling exhibition, Chinese Oil Painting Academic Society. 2008	“Art‧Fancy 2008 Art Fair”, Xinyi Public Assembly Hall, Taipei, Taiwan. 2008	“Hantoo Impressions”, Impressions Art Gallery, Taipei, Taiwan. 2008	“Home – 2008 Taiwan Biennial”, National Taiwan Museum of Fine Arts, Taichung, Taiwan. 2008	“Madden Reality: Post – Taipei Art Group”, Taipei Fine Arts Museum, Taipei, Taiwan. 2009	“First Contact”, Kunming 99 Art Space, Yunnan, China. 2009	“Post Little Tough Guys：Hantoo Art Group 14”, Hong – Gah Museum, Taipei, , Taiwan. 2009	“Akudou Power-2009 Hantoo Art Group”, Lin ＆ Keng Gallery, Beijing, China. 2009	“Art‧Summer 2009 Art Fair”, Living Lounge Gallery, Taipei, Taiwan. 2009	“Taipei Art Fair 2009 International”, Taipei World Trade Center. 2009	“Art Thinks”, Hong – Gah Museum, Taipei, , Taiwan. 2009	“Continuance‧Stride‧New Generation”, Lin & Lin Gallery, Taipei, , Taiwan. 2009	“Dialogue in Art between East Asia and Taiwan”, Cultural Affairs Bureau of Kaohsiung County Government, Taiwan. 2009	“Revolution”, Tina Keng Gallery, Taipei, Taiwan. 2010	“2010 Contemporary Taiwan Art Raise”, Lin & Lin Gallery, Taipei, Taiwan. 2010	“Amazement and Astonishment –Hantoo Art Group`s Adventure to the West”, Chongqing Art Museum, Sichuan, China. 2010	“Contemporary Art of Taiwan”, Gyeongnam Art Museum, Korea. 2010	“Hantoo Art Group 2.0”, Taichung Creativ and Cultural Park ,Taichung, Taiwan. 2010	“The 25th Asian International Art Exhibition”, Mongolian National Modern Art Gallery. 2010	“The Way is Not Between Two Points”, Lin & Lin Gallery, Taipei, , Taiwan. 2011	“Taiwan Modern Artist Exhibition”, National Taiwan Museum of Fine Arts, Taichung,‧National Dr. Sun Yat-Sen Memorial Hall, Taipei, Taiwan. 2011	“10 Year On : Liao Chi-Chun Oil Painting Awards”, Taipei Fine Arts Museum, Taipei, Taiwan. 2011	“The Sentimental Boys! Hantoo Joint Exhibition”, Kaohsiung Museum of Fine Arts, Taiwan. 2011	“The 26th Asian International Art Exhibition”, Hangaram Art Museum of Seoul Art Center. 2011	“Intimate Views”, Lin &Lin Gallery, Taipei, Taiwan. 2012	“Reality . Imagery -Taiwan New Realism ”, Chienkuo Technology Museum. 2012	“Oil Paintings Exhibition”, National Taiwan Arts Education Center, Taipei. 2012	“Taiwan‧Korea Morden Art Exchange Exhibition”, Carrie Chang Fine Arts Center of Tamkang University, New Taipei City. 2012	“Local to Local Taipei in Busan”, OpenSpace Bae Gallery, Busan, Korea. 2012	“Unique Vision II”, National Taiwan Museum of Fine Arts, Taichung, Taiwan. 2012	“Cross-Strait Artists Invitational Exhibition”, Tsuiheng Museum, Zhongshan , Guangdong. 2012	“Evolvement of Neo-Expression”, Taichung, Foundation of Taiwanese Culture. 2013	“Start from Zero”, Metaphysical Art Gallery, Taipei. 2013	“The 27th Asian International Art Exhibition”, Rajchadamnern Contemporary Art Center, Bangkok, Thailand. 2013	“Chinese Academy of Fine Arts Exhibition”, National Dr. Sun Yat-Sen Memorial Hall, Taipei, Taiwan. 2013	“Modernity, the Ever-rising New Wave-Taiwan Contemporary Art 2013”, National Dr. Sun Yat-Sen Memorial Hall, Taipei, Taiwan. 2013	“Revisiting New Horizons Exhibition : Origins of TFAM’s Contemporary Contexp”, Taipei Fine Arts Museum, Taipei, Taiwan. 2013	“Toughened Hantoo souls sentimentally settled here after their drift”, FreeS, Taipei. 2013	“From Upending Reality to Creating Realty: Contemporary Taiwanese Art After the Martial Law Era”, Asia Museum of Modern Art, Taichung, Taiwan. 2013	“Intersecting Vectors”, Taipei Fine Arts Museum, Taipei, Taiwan. 2014	“Pop Art Factory──Heating‧Cooling‧Contemporary Art in Taiwan”, Kaohsiung Museum of Fine Arts, Taiwan. 2014	“The 28h Asian International Art Exhibition”, Kinmen Cultural Park, Taiwan. 2014	“ Re Writing”, FreeS Art Space, Taipei. 2014	“Hao Han-Hantoo’s Exhibition”,Sincewell Gallery,Kaohsiung. 2014	“Re Exhibiting”,FreeS Art Space, Taipei. 2014	“DERIVATIONS III”, Lin & Lin Gallery, Taipei, , Taiwan. 2015	“Society of Spectacular”, FreeS, Taipei. 2016	“A Century of Chinese Paintings World Tour Exhibition”, Shandong Art Museum, China. 2016	“Sketch,manuscript & model of Hantoo Art Group”, Hunguang Arts Center, Taichung. 2016	“Sunrise Heartbeat – Taipei Art District Festival”, LIANG Gallery, Taipei. 2017	“Taiwan 50 Golden Age”, ARKI Galeria , Taipei. 2017	“2017 Asian International Art Exhibition by Taiwan Committee Members”, Carrie Chang Fine Arts Center, New Taipei City. 2017	“Imagery of yore in rear view”, Tina Keng Gallery, Taipei,. 2018	“Dream Blossom”, Metaphysical Art Gallery, Taipei. 2017	“Fight Club-Hantoo 20th”, Kuandu Museum of Fine Arts, Taipei. 1988	“A Grown-Up Dream”, Collected by Taipei Fine Arts Museum, 425x275cm, Oil on Canvas. 1992	“Taipei in the Morning”, Collected by Taipei Fine Arts Museum, 395x265cm, Oil on Canvas. 1994	“Brewing at Dawn”, Collected by Taipei Fine Arts Museum, 500x185cm, Oil on Canvas. 1994	“Views of Taipei”, Collected by National Museum of History Republic of China, 120x120cm, Oil on Canvas. 1995	“Art in America’s 1995 Slides Survey of Contemporary Art”, by Art in America, “New Era” 240x150cm Four Piece Oil Painting. 1996	“Black Bridge”, Collected by Ludwig Forum for the International Art, Germany, 172x172cm, Oil on Canvas. 1998	“Respects to Her”, Collected by Taiwan Museum of Art, 320x250cm, Oil on Canvas. 2000	“Birth‧Life”, Collected by Kaohsiung Museum of Fine Arts,450x181x8.5cm, Mixed media. 2003	“Grandpa’s Stories”, Collected by Taiwan Museum of Art,450x275x66 cm, Mixed media. 2006	“Smile”, Collected by Taipei Fine Arts Museum, 236x189x7.5 cm, Oil on Canvas. 2013	“Sudden Comprehension”, Collected by Long Museum, Shanghai, 277x190x14 cm, Mixed media. 2014	“The View of Near”, Collected by National Taiwan Museum of Fine Arts, 236x189x7.5 cm, Mixed media. 2014	“Soaring”, Collected by White Rabbit Gallery-Sydney, 370 x239.5×6 cm, Mixed media.